Dirk Bogarde stars in Joseph Losey's intense and particularly well written psychological drama. Optimum UK R2 boxset DVD. In the late 1940s, Joseph Losey was a promising Hollywood director with a couple of feature films under his belt - within a couple of years however he was forced to flee the country after his ties to the Communist Party made him a target for the Un-American House Committee hearings. Unwilling to testify against his colleagues, he fled to the UK where he found work, but not without problems. 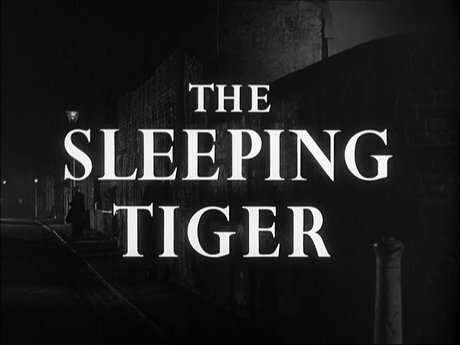 For Sleeping Tiger he was forced to take the pseudonym Victor Hanbury after some of the cast were concerned it might affect their ability to find work to be seen in a film with his name on. Later he would be thrown off a project completely (X the Unknown (1956)) because the American lead (Dean Jagger) refused to work with him. Fellow American witchhunt refugees Carl Foreman and Harold Buchman share the pen name of Derek Frye for this adaptation of a novel by Maurice Moisiewitsch. It's primary theme is not an uncommon one, an exploration of the way that a relationship can be irrevocably altered by the addition of a third party - but the script does not rest on this topic and also tackles a conservative era of long gaol terms and capital punishment with a very leftist look at the age-old nature versus nurture debate and the roots of criminality. Largely dialogue based, Sleeping Tiger works so well because this dialogue is impeccably well written - which combined with the placement of most of the scenes within the Doctor's home, gives the production the atmosphere more of a stage play than a film. A couple of burglary scenes offer a break from this setting but avoid becoming the 'action scenes' that they might have been in a different film, instead playing out with a certain coolness that keeps in tone with the rest of the film. Pacing is, as expected, on the slow side but keeps moving on unpredictably and never drags - in particular the psychological treatment scenes do not become bogged down with pyscho-babble as might have been the temptation. The climax and conclusion are a particular highlight and very effective. Losey takes a very gentle approach to the material - a long term theatre director he realises that the actors and material are more than enough to keep the film going without the need for fancy camerawork or editing. The film is not without flair however, the passing of time is shown subtly with a montage of horse riding scenes with Frank progressing in his skills imbetween talks with the doctor and Losey uses his film noir experience to the full in the nighttime exteriors of London and the nightclub. The only slight flaw in the production comes from some obviously sped-up footage during a driving scene, but it is only used briefly. Composer Malcom Arnold provides a solid soundtrack with some beautifully Noir-ish themes, it is used sparingly but effectively throughout the film. There is not much to be said about the acting, other than to extol its brilliance. Dirk Bogarde in one of his early roles is simply perfectly cast - he had a fantastic ability to switch between upper class and working class roles and this part is a highlight of the latter. A duo of Canadian born actors play the doctor and his wife, Alexander Knox and Alexis Smith with a very fine pair of performances. Dirk Bogarde is superb and aided by a particularly well written script, all held together by a solid, if not the most remarkable, directoral turn from Joseph Losey. Generally recommended, it is a must-see film for any fans of Losey or Bogarde. A generally good print with some grain and minor damage but plenty of detail and well defined tones. Audio Original English mono - sounds good. Availability Only available as part of Optimum's Joseph Losey or Dirk Bogarde Collections. A very well written script and a superb acting display from Bogarde. Recommended. A good print, miles better than the available US disc, although completely lacking in features. Find the DVD reviews of other films starring Stanley Baker. All text in this review written by Timothy Young - 2nd February 2009.